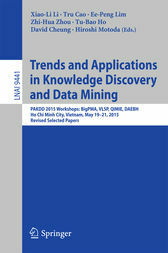 This book constitutes the refereed proceedings at PAKDD Workshops 2015, held in conjunction with PAKDD, the 19th Pacific-Asia Conference on Knowledge Discovery and Data Mining in Ho Chi Minh City, Vietnam, in May 2015. The 23 revised papers presented were carefully reviewed and selected from 57 submissions. The workshops affiliated with PAKDD 2015 include: Pattern Mining and Application of Big Data (BigPMA), Quality Issues, Measures of Interestingness and Evaluation of data mining models (QIMIE), Data Analytics for Evidence-based Healthcare (DAEBH), Vietnamese Language and Speech Processing (VLSP).